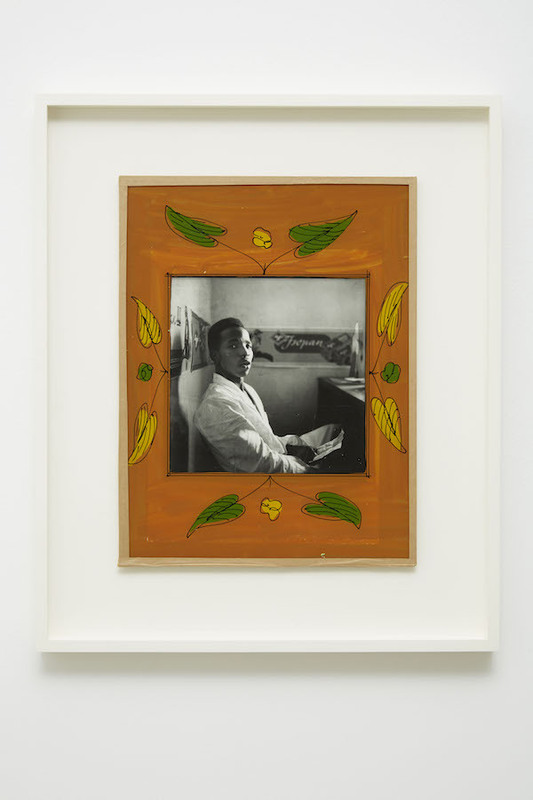 Malick Sidibé, Self-portrait, 1956, silver gelatin print, glass, paint, cardboard, tape, and string, 16 x 12 x 1/4". “REGARDEZ-MOI!” a voice shouts assertively. The photographer turns and swings toward the young man dancing. His knees are bent low, buttressing a torso thrown impossibly far back. His arms are flung wide open, his grin even wider. Snap. The photographer shifts position, steps one foot forward, lowers his camera, and snaps again. The year is 1962. The place is Bamako, Mali. And the photographer is Malick Sidibé, whose formally elegant, dynamically composed black-and-white images testify to the complex modernities fashioned across postcolonial Africa. That they exist as such is cause for both celebration and despair. To be sure, Sidibé has been deservedly lauded for expanding the narrow range of racist Euro-American perceptions of the continent, challenging the colonial archive of African photography no less than contemporary media’s Afro-pessimism. But tethering the photographer’s work to this pedagogical charge has tended to obscure its specificities and depths: its knotty contradictions, its uncomfortable displacements. As Sidibé’s photographs are tasked to correct and defend—to testify to African modernities—our gaze is invariably directed beyond the images, toward evidentiary functions that can stretch and overdetermine their meaning, and ultimately, occlude them. As I remember Sidibé’s passing, and consider his inscription into the historical record, the photograph’s injunction “Regardez-moi”—Look at me—sounds like a dirge. Seeing his work mandates freeing it from its documentary “lesson,” releasing it from the weight of white ignorance—especially because, as Chinua Achebe pointed out, said “ignorance” about Africa is itself a deeply motivated occlusion. 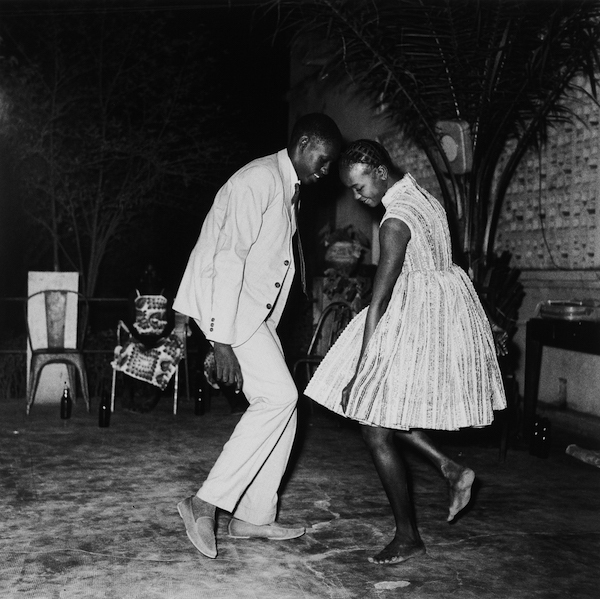 Malick Sidibé, Regardez Moi (Look At Me), 1962, silver gelatin print, 17 x 17". Sidibé’s oeuvre presents as a potted history of enormous visibility matched by equally sizable blind spots. To begin, we might wonder why, among a gamut of varied subjects, Look at Me and Sidibé’s other images of dancing (notably Christmas Eve, Happy Club, 1963) have become his most iconic. It may be—as Sidibé assumed—that such photographs marked a distance from Seydou Keïta’s studio portraits, even as they retrospectively appeared to establish a proximity to Euro-American audiences through internationally legible gestures of dance. Certainly, as we navigate around the Scylla of Afro-pessimism, the lure of seemingly carefree, twirling youth is undeniable. But such images can be a Charybdis of their own, especially when they are transparently linked—as they all too frequently are—with a performance of social or political freedom. A 2009 fashion spread Sidibé shot for the New York Times Magazine titled “Prints and the Revolution” is only the most egregious in the insistent presentation of his work against a facile backdrop of “revolution.” Time and again, the democratic impulse of his images is taken at face value: dancing youths (albeit defying state curfew) are read as signifiers of liberty; studio portraits are touted as a self-fashioning of postcolonial subjectivities. Yet the limits on self-fashioning imposed by religion and state, custom and family—limits that Stephen Greenblatt underscored in the same breath as he introduced the term in his study of Renaissance Europe—are usually forgotten in the rush to rally these images as documents of freedom. 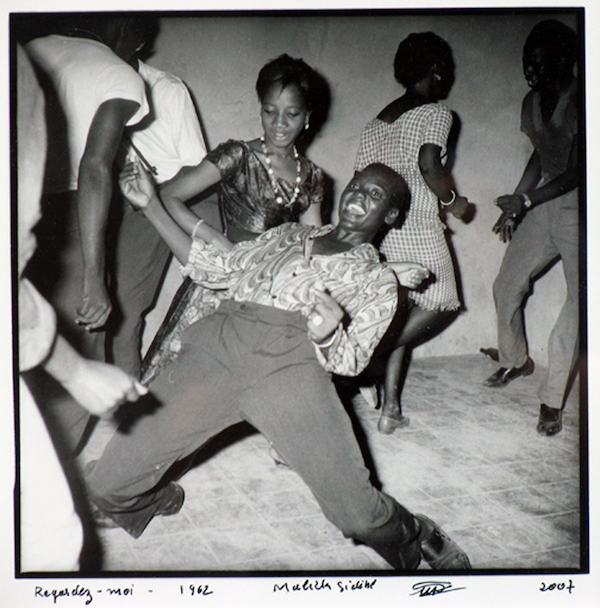 Malick Sidibé, Christmas Eve, Happy Club, 1963, silver gelatin print, 13 x 13". Far from diminishing the centrality of the postcolonial context that undergirds Sidibé’s work, I want to champion an engagement with it that acknowledges how the historically specific contradictions and disavowals of postcolonial Mali trouble a straight line between the photograph and the polis, or between the imagined emancipation of subjects and their performance of it. Likewise, the limits Greenblatt cautioned about the illusory freedom of fashioning the self apply all the more to the illusory, partial knowledge we can construe of another. In this sense, Look at Me is a negative demand: to stop reading me through you, through your projections. The call for Africa to not merely be a mirror of Western narcissism has underpinned postcolonial critiques for the last thirty years. But is it possible for us to surmount our own egos in this way? Some would say not. That the image is always a mirror. That interpretation is always projection. Nonetheless, this is the challenge Sidibé’s legacy throws out to us. Never has the demand to see beyond ourselves been more urgent. Regardez-moi! the photograph calls out. Again. Leora Maltz-Leca is associate professor of contemporary art history in the history of art and visual culture department at Rhode Island School of Design.